Mon, July 30, 2018 7:00 P.M. 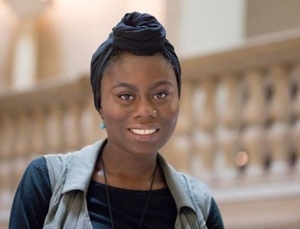 Please come and join us for a launch with a view when 2017-18 Youth Poet Laureate of Philadelphia Husnaa Hashim reads from her collection Honey Sequence, published by The Head and The Hand Press in collaboration with the Free Library of Philadelphia. Husnaa will be reading on the Skyline Room Terrace alongside a few fellow poets and friends, and honey-forward refreshments will be provided. Be sure not to miss this celebration of Husnaa's bold and wholly original voice. For more information about the Philadelphia Poet Laureate Program, please visit www.freelibrary.org/poetlaureate.